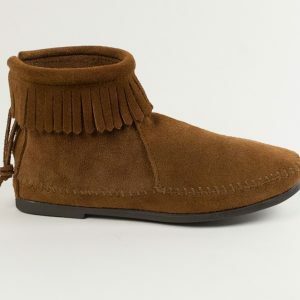 This iconic boot was made for classic style and comfort with soft suede that covers the boot all over, from the lining to the sole. 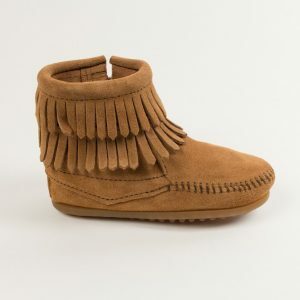 The suede sole forms with every step and will ensure their step is strong, protected, and cozy each and every time. 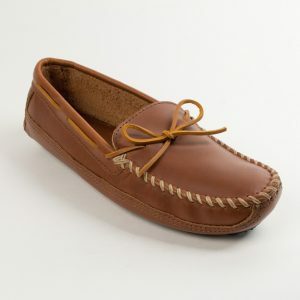 Rawhide laces hold the foot in place and a fully padded insole keep things comfy. 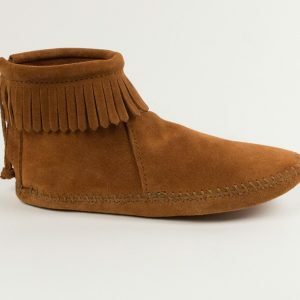 It’s never too early to slip your tot into smooth suede style with these timeless kids boots. Prevent water spots and oil stains with Minnetonka Water & Stain Repellent or a ScotchguardTM product. Simply spray on and allow two hours to dry. We recommend two applications before wearing for the first time, then weekly or monthly treatments depending on how often your footwear is wore. 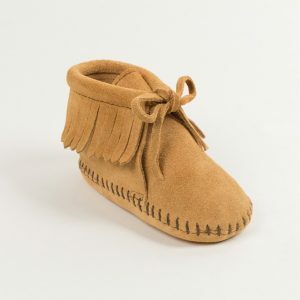 If you like the Classic Fringe Softsole Boot, check out other kid’s moccasins, here!